If you are looking for a romantic dinner for two, grilling a rack of lamb is a perfect choice. You will impress your partner with a sophisticated entree that is easy to prepare and uses common ingredients. Blackberry preserves add a nice fruit flavor without being too overpowering. This fantastic year-round treat, so you can make it for Valentine's Day, your anniversary, or when entertaining that special someone. Of course, if you have folks over for dinner, you can grill more than one rack of lamb and show off your culinary prowess. They don't have to know that the secret is in the jelly jar. Lamb is always high-quality meat, with most lamb sold graded choice or prime. Ask your butcher to remove the thin skin from the outside of the rack and cut off the chine bone to make it easier to carve. Trim the excess fat from the rack of lamb. Place the rack of lamb into a glass baking dish or a resealable plastic bag. 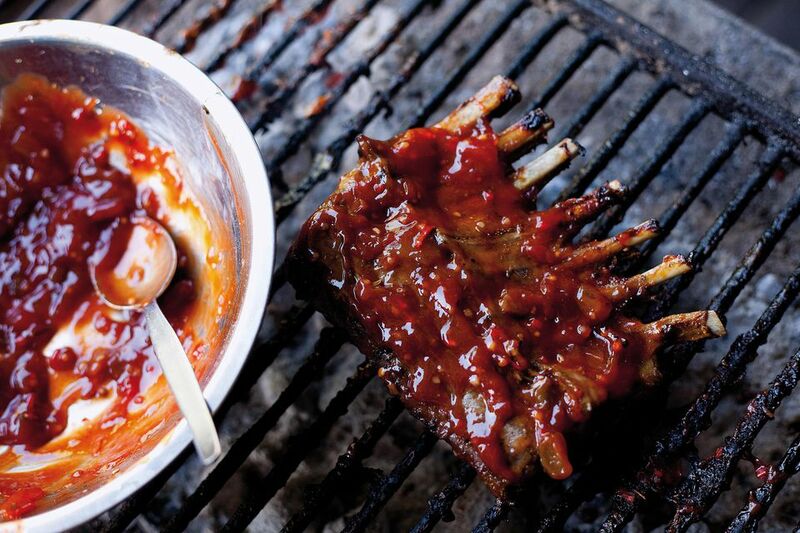 Combine remaining ingredients and slather them over meat portion of the rack. Cover with plastic wrap or seal bag and allow the meat to marinate in the refrigerator for 8 to 12 hours. Remove rack of lamb from baking dish (reserving the marinade). Wrap the bones with aluminum foil and place onto the grill. Make loosely-packed balls of aluminum foil to place under the tips of the bones to ensure they are up off the grill and won't get burned. Sear the rack of lamb for 2 minutes on each side. Then turn the heat down to medium (or move the meat to a cooler part of the grill). Cook the lamb for 30 to 40 minutes at medium heat, turning often and brushing with reserved marinade throughout the cooking process. Once the lamb has reached the desired doneness, remove it from the heat. Rare lamb will be at 120 F (50 C) and medium at about 150 F (65 C). The rack of lamb will go up a few degrees in temperature after you remove it from the grill. Allow 5 to 10 minutes resting time before carving. To carve, stand the rack up with the bones curving away from you. Using a sharp knife, slide the blade down between the bones gently. Cut the rack of lamb into chops by carving between each set of bones. You will serve about three chops per person. You may have a couple of chops left over for enjoyment the next day.